Recently, I’ve been experimenting with amaranth, both the seed and flour, in my cooking. I enjoy incorporating new textures and flavors into our meals. Amaranth provides a subtly sweet, earthy nuttiness, making it delicious in both sweet and savory dishes. Depending on how you cook it, from crispy chewy crackers to breakfast porridge, amaranth is a wonderful addition to your healing diet. Amaranth, a major part in the Aztecs’ diet, has been around for thousands of years. It is naturally gluten-free and holds a powerhouse of nutrients. 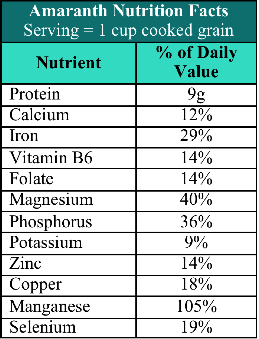 It contains more than three times the average amount of calcium found in grains and is high in protein, iron, magnesium, phosphorus, and potassium (1). Amaranth is also alkaline, making it a wonderful grain for those on an alkaline healing diet. In addition, Amaranth is considered a “complete protein” because it contains lysine (2), an essential amino acid that cannot be produced by the body and plays an important role in growth and development, including the conversion of fatty acids into energy, assists in calcium absorption and collagen formation essential for muscle and bone health. In the fight against cancer, amaranth plays an important supporting role. Amaranth is rich in squalene (3), an isoprenoid hydrocarbon with antioxidant properties. Not only does squalene help prevent cancer, but it can also fight established tumors by cutting off the blood supply to the cancer mass (4). Amaranth also contains Lunasin (5), a bioactive peptiede shown to inhibit the development of cancer cells by penetrating the nucleus of cancer cells more rapidly. Did you know that a bowl of amaranth may also be good for your brain. Polyphenols rutin and nicotiflorin found in amaranth have a neuroprotective effect and can aid in the repair of damaged brain cells (4). Where to buy Amaranth – Amaranth can be found at most health food stores, usually in the bulk food bins. When trying out new grains, I prefer to purchase from the bulk bins so I can buy just what I need for a recipe before committing to a larger package. 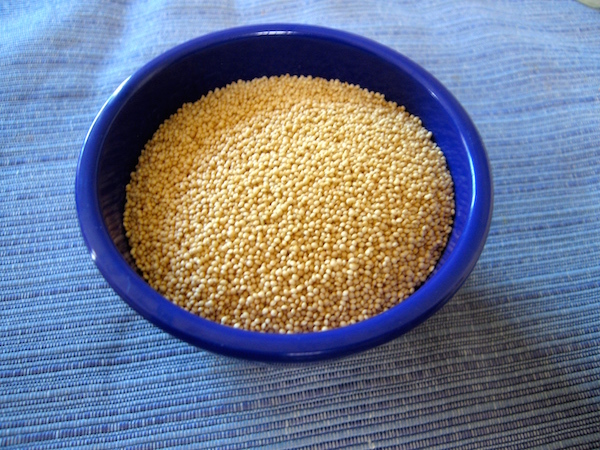 Amaranth seeds – Amaranth seeds can be cooked in a variety of ways. Breakfast porridge – When cooked in a pot over medium heat with 1/2 cup of grains to 1 ½ cups water for approximately 20 minutes, amaranth develops a soft, sticky porridge-like consistency while still maintaining a gentle subtle crunch quality. As amaranth cools it can turn gummy so serve immediately. Just add a drop of maple syrup, dash of cinnamon, your favorite chopped fresh fruit and nuts and a splash of nondairy milk and you have a lightly sweat, nutty and amazingly healthy breakfast treat to enjoy! Popped Amaranth – When amaranth seeds are lightly toasted in a dry skillet over medium heat (stir constantly) just until they turn golden brown and you begin to hear popping sounds, their nutty flavor comes alive. Sprinkle on your salads and soups to add, not only a nutritional punch, but a wonderful nutty crunch. Popped amaranth can also be used to “bread” tofu. Combine with other grains – When cooked with another grain, such as brown rice, amaranth adds a wonderful nutty sweetness. Due to amaranth’s ability to absorb and hold moisture, the rice will take on a more sticky consistency. Stir well to evenly distribute the grains and you will find this wholesome texture quite pleasing. Serve with a stir-fry, chili or even curry. Or add as a filling to a burrito or wrap. Use a ratio of 1/4 cup amaranth to 3/4 cup other grain and cook as usual. Add to cookie or bread dough – Toasted amaranth seeds add a crunchy nutty flavor to cookies and breads. Substitute toasted amaranth for chopped nuts in your recipes. Amaranth flour – Amaranth flour, when used alone in baking, becomes dense and chewy as it absorbs moisture and has an intense earthy nutty flavor that can overwhelm. Although I prefer not to cook with amaranth flour in cakes and breads, there are some other wonderful uses. Crackers – Amaranth flour makes delicious crunchy crackers with a slightly chewy texture. Because of amaranth’s nature to soak up moisture, it is important to store your crackers in a dry cool place (not inside the fridge). My experience has been that these crackers are so good they are devoured soon after baking. However, if you have left over to store, I suggest you layer with parchment paper or a paper towel to help maintain the crunchy texture. Try our recipe for Addicting Amaranth Crackers. Thickener – Amaranth makes a great thickener. In addition to imparting its unique sweet, nutty flavor and all those wonderful nutrients, 1 to 2 tablespoons of flour acts as a great thickener for any soup or stew. Add to your bread dough – Amaranth flour, if used alone in baking, produces a dense, chewy product with a strong earthy flavor. However, adding a ½ cup of amaranth flour to your bread dough, adds a light nutty flavor and moistness to your final product. Amaranth greens – Amaranth greens are not available where we live. However, my daughter is experimenting growing them from seed in our backyard in the hopes of trying this delicacy. In China, India, Mexico, Greece and Africa, they eat the leafy greens in salads and stir-fries. This entry was posted in cancer, Nutrition, Plant-based, Recipes, Vegan, WFPB, Whole food and tagged anti-cancer diet, healing grains, healthy eating, nutrient rich foods. Bookmark the permalink. I enjoyed reading your post! I’ve been loving amaranth lately for breakfast porridge. Great information on health benefits and other interesting ways to use this grain! I’ve never tried amaranth – is this similar to quinoa? Sounds delicious and very healthy – I’ll have to give it a try! I am excited to try these new ways for me to use amaranth. I like the idea of “popping ” it and substituting it for nuts. Thanks for great information.